Wow. I haven’t blogged in seven months. I could have almost had a baby in that time! HA! Or I could have gotten in amazing shape. Or I could have… well, I could have done a million things but I’ll start by telling you a couple things I HAVE done in the last seven months. Ok, well, one thing I didn’t do: I didn’t run that half marathon I started training for last fall. It was supposed to be in February. I ended up having to travel for work that weekend and when I found out about the trip I lost all my momentum (and I lost my entrance fee I’d already paid too). I also injured my hip somehow and was getting acupuncture treatments for a few months… and then I FELL on my hip while stepping up on a curb while running… so anyway, I stopped running altogether. Maybe I’ll get back to it at some point. The very most awesome thing that has happened is that I got a NEW JOB that I love! I am still a Marketing Coordinator. But now I am working from home for a not-for-profit society. I won’t go into detail because its a very specific green construction industrial segment that will likely bore you… haha. But it’s not boring to me and that’s all that matters! I’m just absolutely thrilled with my new position. October- Chicago again- I love it there so no problem with this! November- Calgary- my first trip to Canada! Whew. I’m still cooking lots of vegan food. I’m still Instagramming all the time (obsessed might describe it). And I’m still NOT on Facebook– which is seriously awesome. I never miss it. It’s been months and months and months. I was seriously addicted to Facebook so this was a necessary cutting of the ties. I tweet every now and then, but it’s pretty few and far between. I’ve been working from home a little over a month now, but just got my office set up last weekend. I needed to hit up Ikea. I plan to do an office tour soon- when I get it all set. 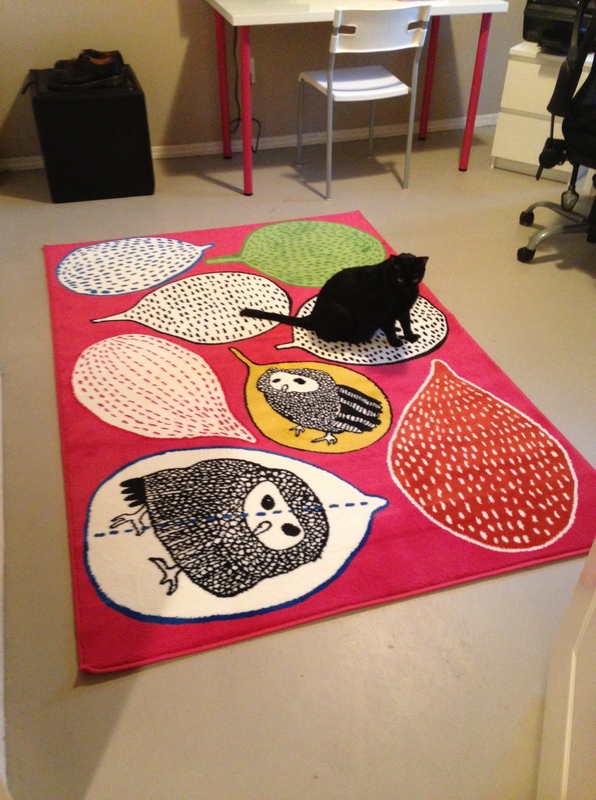 In the meantime- here’s a pic of the cheerful rug I picked, and my beloved Nathan checking it out. A. So nice to see you blogging again! So happy that you are happy and am glad that we still cross paths on Instagram. As time goes on I’m finding myself pulling away from social media more and more and I must admit I don’t miss it as much as I expected either. Here’s to safe travels for the remainder of the year! Yay! Happy to see you blogging again. I’m completely jealous of your two trips to Chicago.